Bill Doss (September 12, 1968 – July 30, 2012) was an American rock musician. He co-founded The Elephant 6 Recording Company in Athens, Georgia and was a key member of The Olivia Tremor Control. Following the band's break-up, he led The Sunshine Fix and later became a member of The Apples in Stereo. Doss was married to freelance photographer Amy Hairston Doss, whom he met while both were attending Louisiana Tech University. Doss was a native of Dubach, Louisiana, where he met Will Cullen Hart, Robert Schneider and Jeff Mangum, his friends at nearby Ruston High School. Before the Olivia Tremor Control Doss had recorded under the name The Sunshine Fix, and self-released A Spiraling World of Pop, which later helped comprise The Olivia Tremor Control songs. Before the Olivia Tremor Control, Doss had spent some time in the army, after which he joined New York based band Chocolate USA before heading back to Athens, Georgia, where at the time of his death he was still a resident. Doss, Hart and Mangum soon formed what was later to become the Olivia Tremor Control. After Mangum left the band to pursue his own Neutral Milk Hotel, Hart and Doss began to pool their musical influences, Hart being a proponent of experimentalism, Doss of 60's pop such as The Beatles, the Beach Boys and The Zombies. After the release of the second The Olivia Tremor Control album, Black Foliage, the band broke up in 2000. Doss went on to restart The Sunshine Fix. That band's first full-length album, Age of the Sun, was released in 2002. In 2004, TSF released the less well received Green Imagination (which featured artwork and videos by Kevin Evans). 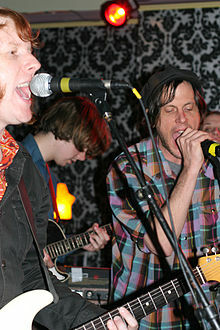 Doss began touring with The Apples in Stereo in early 2006, playing keyboards. He appeared on the Apples' 2007 album New Magnetic Wonder, was listed as a full-fledged band member on the band's 2010 album Travellers in Space and Time, and contributed to the songwriting on both albums. At the time of his death, Doss was producing albums in his own studio in Athens. Doss's death was announced on July 31, 2012, with The Olivia Tremor Control confirming it on their official website. He died of an aneurysm. ^ Benjamin Ricci. "Memorial details for Bill Doss, beloved Elephant 6 co-founder". performermag.com. Archived from the original on August 5, 2012. Retrieved August 6, 2012. ^ a b c David Bevan (July 31, 2012). "Bill Doss, Dead at Age 43, Olivia Tremor Control Member and Elephant 6 Co-Founder". SPIN. Retrieved July 31, 2012. ^ Andre Gallant (July 31, 2012). "Olivia Tremor Control's Bill Doss dead at 43". OnlineAthens. Retrieved August 2, 2012. ^ "Apples in Stereo's Robert Schneider gave up a flourishing music career to chase his true passion: Math". Atlanta Magazine. February 22, 2018. Retrieved February 23, 2018. This page was last edited on 1 February 2019, at 02:55 (UTC).